Some were shocked to see them launch then Governor Lynch off the big jump! Evidence of their prior shenanigans. Last minute painting happening at the Super Secret Porcupine Speed Worx Facility. Racing the weather, precipitation heading this way. Wish us luck! Weather looks good for Saturday's Race. More supporters are planning to be there. The biggest Cardboard Porcupine ever created should wow the judges and the crowd Woohoo! When he isn't building awesome Cardboard Sleds Johnson has been known to storm the Fed Fortress in Concord as the Noble Cardboard Knight. Mt. Sunapee! See ya there! Super good time. Nice turnout of FSP supporters. From the very beginning of the day, it was obvious by people's reaction that the Robo-Porcupine was something special. Jim Johnson and Lauren Canario's guidance and creative influence, added with the effort of the kids William and El Brentino, combined with new team member Ethan to a victory of Most Creative Entree! A video crew from WMUR's show New Hampshire Chronical interviewed and shot a good bit of footage. They said the piece would air this Thursday. Should be a PR triumph for the FSP. Free Staters having fun, getting noticed. The porcupine, mascot of the Free State Project, is a peaceful animal that can use its quills in self-defense. The Robo-Porcupine cardboard sled was designed and engineered by Free State Project early movers Jim Johnson and Lauren Canario as a homeschooling project. Under their guidance the kids, along with recent mover Ethan Glover, got together once a week to help make their concept a reality. Using only cardboard, duct tape, paint, and wax, the team under the guidance of Jim the Master Craftsman, transformed Creature Creator Lauren’s design sketches into an amazing sled. WMUR's show New Hampshire Chronicle videotaped the event and interviewed participants. Their coverage will air on Thursday, April 16th at 7:00 p.m. This isn’t the first victory for the dynamic duo. 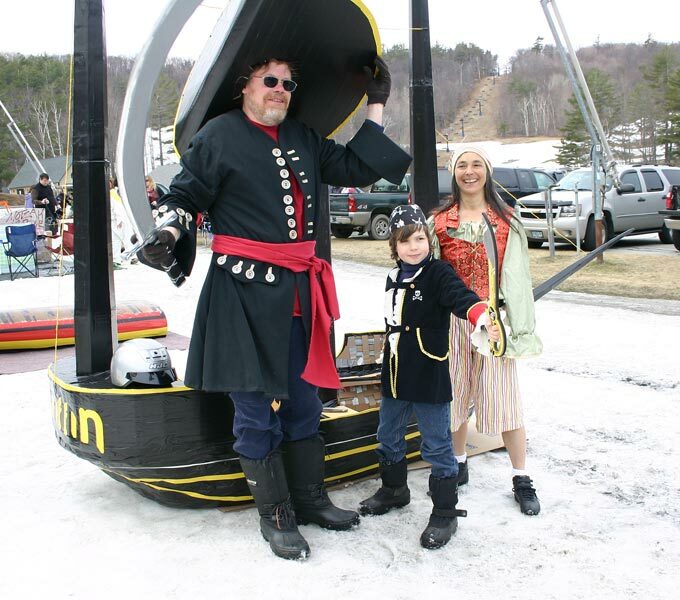 As 2009 Cardboard Sled Race Champions they created the awesome Pirate Ship, Griffin, for the event at Mt. 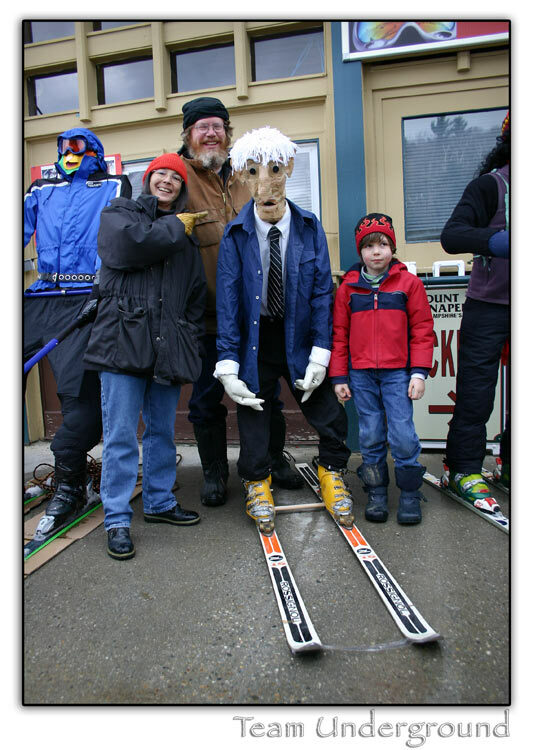 Sunapee also winning the Most Creative category. In the past they honed their skills as internationally acclaimed Kinetic Sculpture racing World Champions. Winning the grueling pedal powered championship race in their artistic creation got them invited to travel to Australia for an exciting build and ride event there. 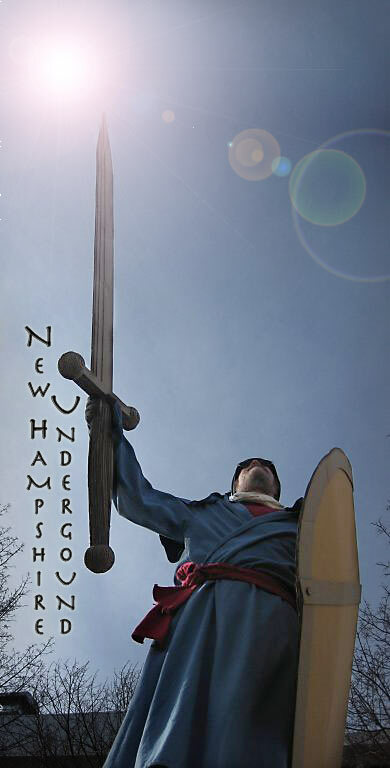 They came to New Hampshire from Nevada via New London, Connecticut where they helped the brave holdouts in Fort Trumbull in resisting the abusive Eminent Domain taking of their homes. Fort Trumbull is the neighborhood made famous in the landmark Kelo Supreme Court ruling. Lauren was arrested and imprisoned for three months. Since moving to New Hampshire in 2006, they have not only helped build and repair homes for Free Staters to settle into, they are also major contributors to the fun factor in the Porcupine Community. Sent this write-up out in their weekly e-mail. 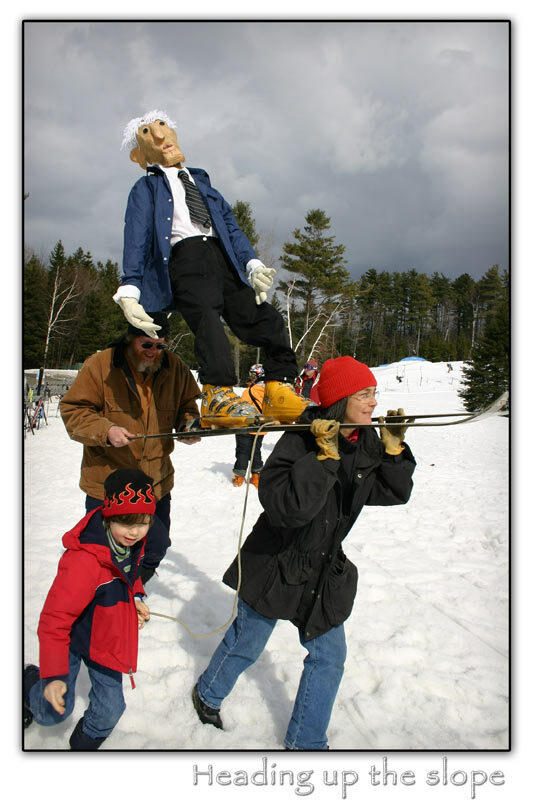 The New Hampshire Chronicle episode of the Cardboard Sled Race is up on the web. Well done to the Robo-Porcupine crew! Thanks to Shire Liberty News for a nice write-up. What folks are saying on the FSP Facebook thread.